Originally invented by Kaspar Winkler, the founder of Sika in 1910, Sika®-1 was a quick setting waterproofing admixture for mortar, which was used to waterproof the Gotthard Tunnel, enabling the Swiss railway company to electrify this important connection between Northern and Southern Europe. A new, upgraded Sika®-1 Pre-Bagged Waterproofing System* for superior performance and easier application is now available. The 4 Sika® -1 Pre-Bagged Mortars, consisting of a blend of special cement and kiln dried graded aggregates, are ready-made with Sika®-1 waterproofing admixtures included as a powder, removing the need for a separate liquid waterproofer – just add water. Packaged in 4 grades, each mortar is specifically designed for optimum application performance and durability. 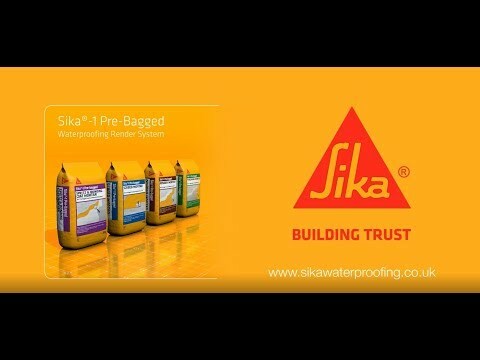 The Sika®-1 Pre-bagged waterproofing system consists of a render system for use on walls and overhead surfaces, and a screed system for use on the floor. The original Sika®-1 Pre-Bagged Waterproofing System is also available as a BBA approved structural waterproofing system, consisting of watertight renders and screeds produced by mixing diluted Sika®-1 Waterproofing Liquid and Sika®-1 Pre-Batched Mortars. *BBA approval pending. For BBA approved requirements please use the original Sika®-1 system. Once applied there is no requirement for drainage products or equipment such as water pumps. Sika offers a guarantee when the product is installed by a registered contractor.